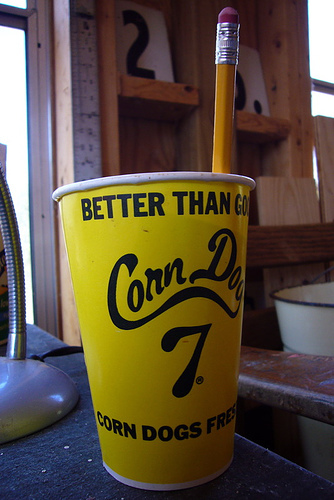 Corn dogs, cheese-on-a-stick, curly fries, cold coke or a fresh-squeezed lemonade for the hot summer days. Always fresh and hot. Thanks to visitor from 66.32.46.152 who reminded us that the Hot Dog place was named Corn Dog 7 - no idea what the name meant. wasn't that a corn dog 7?? I always wondered that too. Remember they had those fried cheese on a stick? 2 for 1 with a gigantic freshly squeezed lemonade... Great! 9/12/2010 Yeah, that lemonade was awesome. They also sold corn dog nuggets which were way easier to eat than a whole corn dog on a stick. I remember eating the nuggets with a honey mustard dipping sauce. They were so good.